Etobicoke is a wonderful place to purchase your first (or second) condo. This western area of Toronto is chock-full of gorgeous scenery and is only a short distance from the airport. For those that are looking to embrace a greener lifestyle, condo living provides the ideal way to do so. When looking for condos in Etobicoke that are built green, where do you start? West Village by Tridel: Tridel is known for their superior buildings and their West Village condos are no exception. Designed with green living in mind, West Village Phase 1 and West Village Phase 2 (3 is coming soon!) provide the ultimate in environmentally-friendly luxury. Both buildings are certified LEED® gold buildings. This is an important characteristic considering that LEED (Leadership in Energy and Environmental Design) is the most acknowledged green certification system in North America. Each West Village unit is stocked with low flow faucets and and Energy Star™ appliances. Besides their green certification, design and appliances, West Village condo buildings come equipped with the usual amenities such as a swimming pool and gym facilities. Key West: Brought to you by TIMES GROUP, Key West is a building of condos in Etobicoke for the environmentally conscious homeowner. The company remains committed to creating an environmentally sustainable environment with each of their projects and Key West doesn’t stray from the pack. Like West Village, Key West is LEED® certified and incorporates energy-efficient features into each unit. By using green construction practices, TIMES GROUP opts to minimize waste without sacrificing quality. Located on the Etobicoke waterfront, you get a great view and get to enjoy a green lifestyle. Millgate Manor 3: Not exactly a fully green condo building but the Millgate Manor 3 complex by Tridel is doing something right. This highrise allows residents to do their part to reduce landfill waste. This building features a converted garbage chute that is devoted to organics only. As far as waste reduction methods go, this is a big one because most of us already throw out too many organics instead of composting them. Energy efficiency: Look for Energy Star™ appliances because they make lower energy consumption possible. The same goes for double glazed, Low-E windows since they can not only reduce your monthly heating and cooling costs, but reduce your energy consumption as well. Air quality: The quality of air extends to inside and outside your unit. Most new construction condo buildings are designed to provide continuous fresh air to units once they are occupied. Some even have CO2 monitors in the parking facilities that are designed only to activate air handled equipment as needed instead of all the time, thus preserving energy. Moreover, the interior laxed-based paints and sealants used should be energy efficient and each unit should be well-ventilated and sealed to deter air transfer and energy loss. Efficient water management: Living green should include energy efficient dual flush toilets and water management. Look for Energy Star™ washing machines because they can function with less detergent and water yet still get your clothes clean. In addition, shower heads and faucets should be low flow high-pressure to ensure that water isn’t wasted. Water management can also include landscaping that captures rainwater for storage to be used for irrigation. Environmentally-friendly features: These could involve everything from secure on-premise bicycle storage to a close proximity to public transportation. Another great environmentally-friendly feature is a on-premise recycling disposal system where waste is separated. Furthermore, you can ask the developer if they diverted their construction waste and recycled the leftover materials instead of leaving them to rot in a landfill. It’s important for condo buildings in Canada to have some green elements because the building process does have a certain environmental impact. Furthermore, it gives residents peace of mind knowing that the condo they live in was built using green materials or has environmentally sound features. For instance, the inclusions of an organics only refuse chute or is in walking distance to a streetcar stop. If you’re in the market for an environmentally-friendly unit to purchase, we can help. 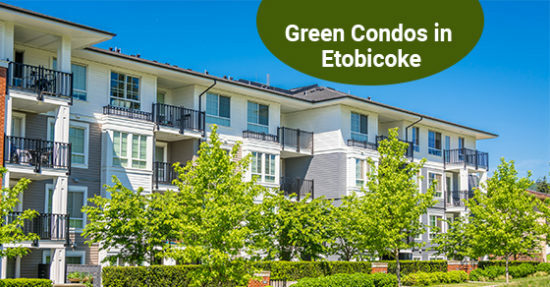 Our brokers have access to green condos in Etobicoke that will compliment your energy-saving lifestyle perfectly..